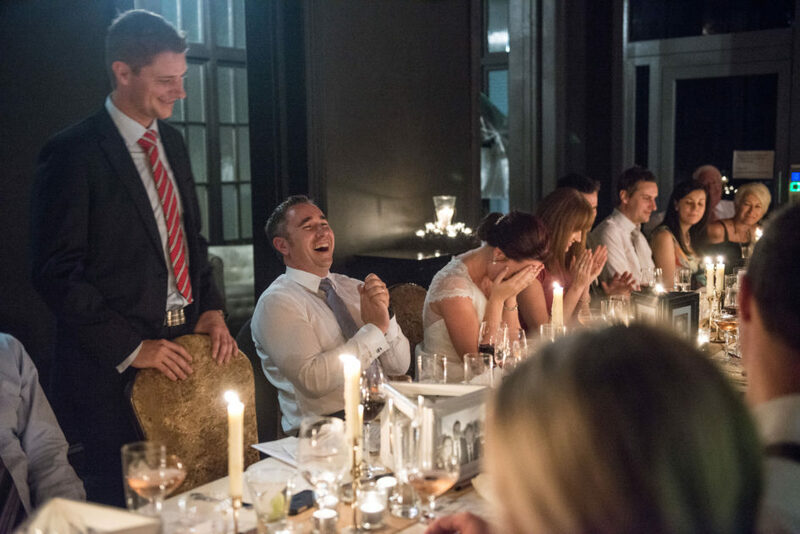 Whether you’re paying a professional or getting your friend or hilarious uncle to act as the Master of Ceremonies, the MC is a huge role on the night of your wedding. I know you have all seen the difference a great MC can make to the atmosphere and energy of a wedding and the cringe-worthy effect a bad one can have too. So here are my tips to make sure you choose the right person to be your MC, and how to make sure everyone gets the outcomes they want for a great party on the night. Before you even talk to anyone about who should be the MC, you need to figure out what kind of MC you need for your wedding and what role they should be playing. The MC is the host of the whole evening – they are the face of the wedding, they control the timings, they know what’s coming up and they field questions from guests and vendors (rather than them bugging you all night about when desert is!). Visualise the evening in your mind – are they hilarious, or would you like the attention solely on the speakers and event itself? Do some people need marshalling and they have to be a strict timekeeper and great crowd manager? Figure out what you need first of all so you can communicate this to your chosen one. If you are choosing a professional, make sure you’ve seen examples of their work to make sure they are the right fit of humour and tone for your function and find out how much they’re willing to work with you to personalise as you like. If choosing a friend, make sure you don’t just ask them, make sure you discuss the role and expectations with them and then ask – it’s a huge responsibility to be an MC. You can’t drink all that much, it’s a thankless role generally, and you’re ‘working’ all night. Ask genuinely and be prepared for people to say no. Once you’ve chosen your person, that’s a great step – but it doesn’t stop there. Remember, this is just the start of your relationship as you both have a lot of information to get through and communicate to make sure this comes off great. I don’t know about you, but I have sat through too many weddings where the MC got a speakers name completely wrong and its just embarrassing for everyone. It is your role to make their job easier – if they get a name wrong, that’s on you. So make sure they have the detailed run sheet – not just the one you give the guests in their menu. Make sure they have the vendors names so they can ask for more information themselves on the day and know who to introduce themselves to. Make sure they have information on speakers well in advance of the day and give mini biographies or introduction points on each speaker so they have plenty of material to work with. Any time you invest here will be rewarded on the night. • Would you like games to be played as a filler/entertainment? You need to give guidance – can they choose their own or would you like a final say? • Are there strict time limits and/or a speaker that is likely to go over time? Discuss with your MC what action you would like them to take in this event. • Are they a bit of a saucy MC? Maybe its best to set some limits on ‘no-go’ zones just in case. • Are there any thank yous you would like them to say for you? It can be a great time saver (and boredom buster) to let the MC say some thank yous on the couple’s behalf to vendors, wait staff, people that set up on the day etc etc. This keeps your speech on point to the key thank yous and spreads it out for the whole evening. Once you’ve set expectations, given them the information and set some rules, that’s it. Walk away and let them do their job. Don’t overload them with too much responsibility or micromanage or it will become a chore for them. They will definitely want to be the best MC they can be for you and your wedding, its your job to let them have enough free-reign so they can achieve this goal – and also find a little time to enjoy themselves too!